3 x 3 notecards are one of my favorite things to make in bulk because they are useful for so many occasions. Hi friends, Linsey here today sharing a simple set of 3 x 3 notecards that I hope will inspire you! Keeping with an all-occasion design on the front of your 3 x 3 notecards and leaving them blank on the inside makes them super versatile and even handier. I wanted the card fronts to have an easy, yet striking design and discovered a way to accomplish both with a few fantastic products from the Scrapbook Adhesives by 3L® family. Here’s how! Choose a general design, theme (if any) and colors for 3 x 3 notecards. If making in bulk, it’s best to pre-cut all cardstock and paper first. Cut cardstock into 6 3 x 6″ pieces, then score and fold in half to make 3 x 3. 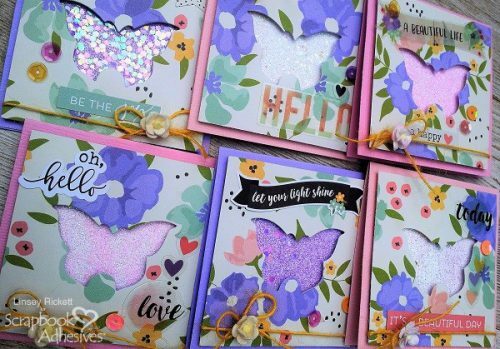 Cut 6 2-3/4 x 2-3/4″ pieces coordinating patterned paper, then cut a window shape in the center of each piece of patterned paper with a butterfly etched die or shape of choice. A punch would also work nicely here. Cut 6 2 x 2″ pieces of white cardstock, then set all cut papers aside. Adhesive Sheets 4×6 inch sheets were used. However, when doing bulk 3 x 3 notecards, Adhesive Sheets 6×12 inch is recommended. Cut Adhesive Sheet into 6 2 x 2″ pieces. Remove backing and adhere to front of each 2 x 2″ piece of white cardstock. Next, adhere white cardstock to the center of each 3 x 3 notecard base with E-Z Runner® Permanent Strips Dispenser. 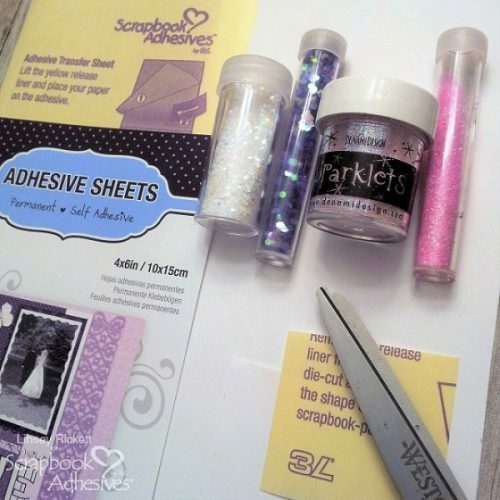 Pull off the liner of Adhesive Sheet piece and cover entire 2×2″ front with glitter. Gently tap off excess from the back of notecard. I experimented with fine, regular and chunky glitters and they all adhered flawlessly to the Adhesive Sheet. The result was a smooth, fully covered 2 x 2″ square of sparkling cardstock every time! 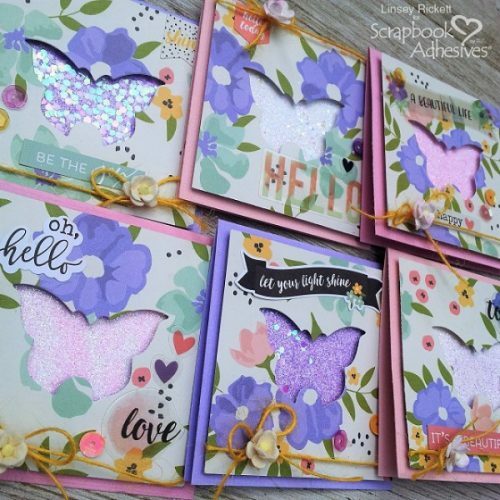 Now add 3D Foam Squares White Mix to the back side of the patterned paper pieces and adhere each to the front of 3 x 3 notecards, centering the butterfly shape window over the glittered cardstock piece. Finish with a simple embellishment, such as ribbon, twine or little sequins, added here using Adhesive Dots Micro. Add a sentiment, if desired, or leave as is and consider this batch of 3 x 3 notecards complete! Thanks so much for visiting today and allowing me to share my 3 x 3 notecards with you! 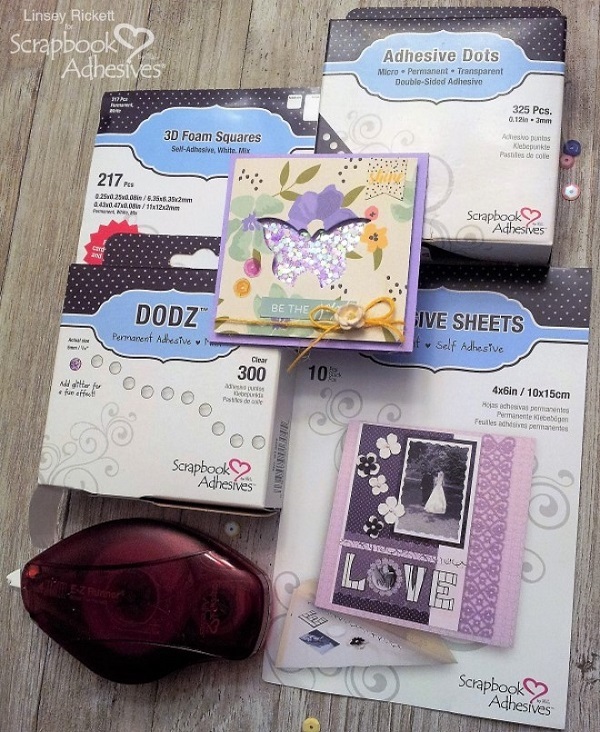 I hope you enjoyed this project and feel inspired to make something special with Scrapbook Adhesives by 3L®! Until next time, happy crafting! This entry was posted in 3D Foam Squares, Adhesive Dots & Lines, Adhesive Sheets, Adhesives, Cards, Crafts & Tutorials, E-Z Runner® Dispensers, Intermediate, Permanent Adhesive, Skill Level and tagged 3D Foam Squares Mix White, 3D Foam Squares Regular White, 3D Foam Squares Small White, Adhesive Dots Micro, Adhesive Sheets 4x6", Adhesive Sheets 6x12", Card, Card Making, E-Z Runner Grand Dispenser, E-Z Runner Grand Permanent Strips Refill, E-Z Runner Permanent Strips, E-Z Runner Permanent Strips Refill, E-Z Runner Permanent Strips Refillable, E-Z Runner Permanent Strips Refillable Value Pack, Linsey Rickett, Window Card. Bookmark the permalink.